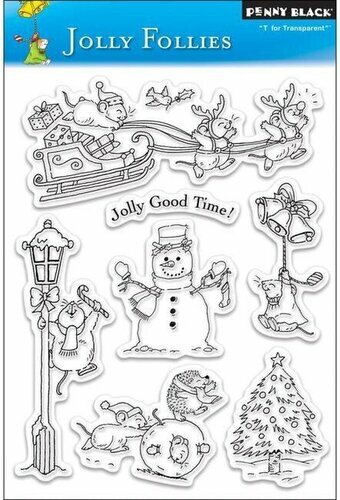 Christmas themed clear Stamps featuring the sentiments "Special delivery from the North Pole", "May all your Christmas wishes come true", "Thinking of you", "Happy New year", and more. A fun holiday frame with star and holly detail. Use it on its own, or use it with the coordinating die set. Coordinates with CED3151 "Festive Collection Eve". Rubber cling stamp. Clear stamp from Brutus Monroe featuring a Reindeer. A wonderfully detailed wooden gate creates a charming and warm welcome not only at Christmas time, but any season. When paired with the coordinating die, this stamped image turns into a substantial dimensional embellishment ready to use on cards, layouts and even altered art pieces. Also ideal to use as a foundation to build your very own scene by using this decorative stamp as a large background image. Embellish with florals, vines or as your heart desires to coordinate with any theme or season. 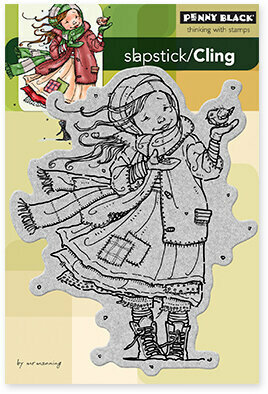 This cling stamp set is part of the Celebrate the Season Collection and pairs with the Festive Gate Die. Approximate Image Sizes: 1. Festive Gate: 6.0" x 4.0". These cling stamps are ready to use with Acrylic Blocks. Start your greeting with the large JOY image and complete your merry holiday sentiment with one of the lead-in or follow-up phrases packed into the Filled with Joy stamp set. This assortment will help you customize both the card front as well as provide options for an interior sentiment. 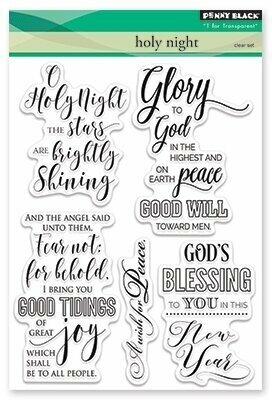 Use it in conjunction with our Filled with Joy Die-namics or pair the clean, universal phrases with other Christmas imagery already found in your collection. Clear stamp sets include the name of the set on the sticker for easy identification. Our clear stamps and Die-namics are made in the USA. This stamp set is just for you, deer! This deer and bear love to "hang" on your card or craft. These stamps can be used on their own, but also coordinate with For You, Deer Add-On to create cute gift tags or bookmarks! It is perfect for teachers or bookworms in your life. Approximate stamp sizes: deer: 7/8" x 1 1/2", deer behind: 7/8" x 1 7/8", bear: 1" x 1 1/8", bear behind: 1"x 1 5/8". Made with care in the USA! 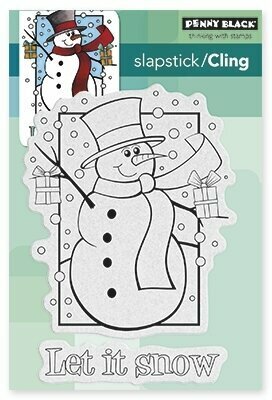 Christmas themed Penny Black Slapstick cling stamp featuring Frosty the Snowman and "Let It Snow". Christmas themed Penny Black slapstick cling stamp featuring Garlands of holly. Christmas themed Penny Black Slapstick cling stamp featuring a little girl with a bird. A Mo Manning design. Marianne Design Stamps Giftwrapping: Twigs & Twine. 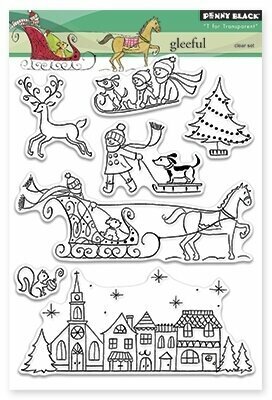 This set of 11 stamps and 10 dies is perfect for decorating your Christmas projects. Try them out on gift tags to add some dimension. Includes 11 stamps and 10 dies. This clear stamp set features four of our Girlfriends inside a holly wreath, holly berries, ornament, string of lights, snowflake, candy cane, Christmas tree icon, and sentiments "Your friendship is the best gift!" "Don't stop believing" "Naughty or nice" "Ho! Ho! Ho!" "Merry Christmas" "Wishing you the merriest of Christmases!" Set of 13 clear stamps. Christmas themed Penny Black Slapstick cling stamp featuring the sentiment "May God's love be with you and bring joy on Christmas day". 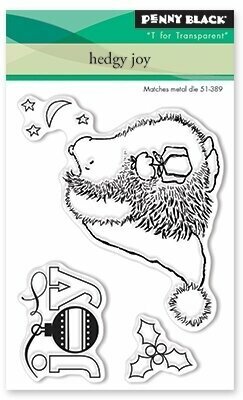 Christmas themed Penny Black clear stamps featuring a hedgehog wearing a Santa hat, "Joy", and holly leaves. Peel stamp from backing and place on acrylic block, using printed image for placement. Apply ink and press. Wipe stamp clean using soap and water or stamp cleaner. Allow to dry. A happy hippo wants to be what you want for Christmas. Image measures approximately 2-3/4" X 2-1/4". This original design by Fran Seiford is deeply etched and precision cut from premium gray rubber on a 1/8" gray rubber foam backing then mounted on a cling vinyl decal with full sized image for easier storage and use with an acrylic handle sold separately. Made in the USA. Accessorize our Holiday Mansion Set with these Halloween and Christmas items! Includes Monster, window boards, jack-o-lantern pumpkin, "Welcome little monsters" sign, spider webs, two ghosts, floating eyes, "wishing you a spook-tacular Halloween! ", reindeer, bells, stack of presents, Santa waving, Christmas tree, wreath, and "A very Merry Christmas from our home to yours!" Set of 17 clear stamps and 12 corresponding dies for larger images. Christmas themed stamp featuring Santa, a snowman, presents, and more! Includes 10 stamps. 4 x 6 stamp set. Christmas themed Penny Black slapstick cling stamp featuring hedgehogs and mice. This is a clear photopolymer stamp set measuring 4 x 6 inches. This clear stamp set features holly, snowflakes, "Have a holly jolly Christmas", "Noel", and "Let it snow". 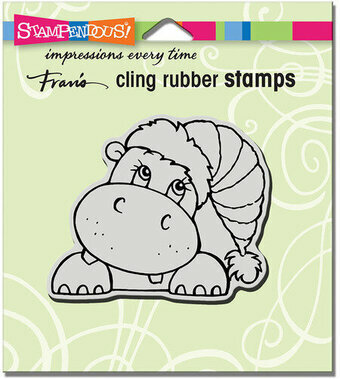 Impression Obsession clear stamps are made in the USA from the highest quality photopolymer. Christmas themed Penny Black slapstick cling stamp featuring a sprig of holly. Christmas themed Penny Black clear stamp featuring the sentiments "O holy night, the stars are brightly shining", "Glory to God in the highest and peace on earth, good will to men", "and the angel said unto them: Fear not, for behold. I bring you good tidings of great joy which shall be to all people", "A wish for peace", and "God's blessings to you in this new year". Christmas themed Penny Black clear stamps featuring a Christmas village. IndigoBlu Cling Mounted Stamp featuring a reindeer, a Christmas Ornament, a Christmas Light, a Christmas Tree, and more. A great addition to any creative project! These are quintessentially English rubber stamps with unique and highly detailed deep etched designs. 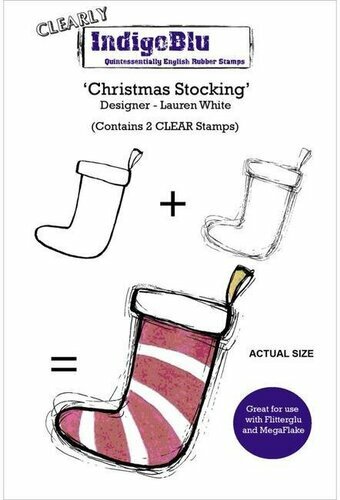 Christmas themed IndigoBlu Clear Stamp featuring a Christmas Stocking. A great addition to any creative project! These are quintessentially English rubber stamps with unique and highly detailed deep etched designs. IndigoBlu Cling Mounted Stamp. Features the sentiment "Merry Christmas and a Happy New Year". A great addition to any creative project! These are quintessentially English rubber stamps with unique and highly detailed deep etched designs. Christmas themed IndigoBlu Clear Stamp featuring Christmas Presents. A great addition to any creative project! These are quintessentially English rubber stamps with unique and highly detailed deep etched designs. A 4"x6" set of clear stamps, made of the highest quality, non-yellowing polymer. The Joy and Peace stamp set contains 11 stamps to mix and match for creating several greetings. Create sentiments such as: JOY to the world, or Wishing you PEACE and JOY. The stocking and ornament "JOY" measures 1.875" x 1". The "Peace" stamp measures 2.25" x 0.75"
Features the Christmas sentiments "peace", "joy", "be with you", "may the season bring you", "happiness", and more! Christmas themed Penny Black slapstick cling stamp featuring a dove. Penny Black clear stamps featuring the sentiments "Let It Snow" and "Peace and joy to all". Christmas themed Penny Black clear stamp featuring a deer, holly, poinsettias, and a mailbox. Joyful Season Angel Stamps Zenspired Holidays Collection by Joanne Fink is a cling foam (EVA) rubber stamp designed to be used with an acrylic block. Zenspired Holidays Collection by Joanne Fink brings her signature creative drawing techniques into the holiday spirit. For fans of Zenspirations, it is an inspiring to a fun-loving array of designs and a must have in your collection. Approximate Size: Joyful Season: 2.05 x 1.60 in 5.20 x 4.10 cm, Angel: 2.75 x 3.45 in 7.00 x 8.80 cm. Our Kitsch Christmas stamps are so fun! We love the retro style of fonts and images. 20 total stamps. This clear stamp set coordinates with our AVE-D-16-34 Kitsch Christmas Die set. Christmas sentiment stamp measures: 1 3/4" x 3/8"; bow stamp measures: 1" x 5/8"; left deer stamp measures: 1 5/16" x 2 5/8"; right deer stamp measures: 2" x 2 5/8". Our Exclusive clear stamps are proudly made in the USA. Christmas themed Penny Black Slapstick cling stamp featuring Poinsettia flowers. This sprig of flowers and holly is a Christmas classic. Image measures approximately 4" X 4". This original design is copyright Laurel Burch. It is deeply etched and precision cut from premium gray rubber on a 1/8" gray rubber foam backing then mounted on a cling vinyl decal with full sized image for easier storage and use with an acrylic handle sold separately. Made in the USA. Whimsical birds with a ribbon and bow can provide lots of options for a Heavenly Holiday. Artist Laurel Burch strove to create images that would remind people of the ongoing world of the spirit. This original design is copyright Laurel Burch. It is deeply etched and precision cut from premium gray rubber on a 1/8" gray rubber cling foam for easier storage and use with an acrylic handle sold separately. Made in the USA. Stainless steel wafer cutting dies make cutting out both birds easy and simple. 6 stamps and 2 dies. Made in China. Largest bird measures approximately 2-1/2" X 2-1/2". This framed, holly pup is an ideal focal point for card or home decor project. Image measures approximately 4" X 4". This original design is copyright Laurel Burch. It is deeply etched and precision cut from premium gray rubber on a 1/8" gray rubber foam backing then mounted on a cling vinyl decal with full sized image for easier storage and use with an acrylic handle sold separately. Made in the USA.